Tools of this type are usually a lifetime investment and if they are maintained correctly and kept away from butchers, they have a very long life, usually in excess of the original buyer. Wilkinson are a very old company with a history of making blades for some hundreds of years. They make 3 sizes of professional tailors shears. You can generally get a better price by buying from a company called Prosharp. This is a 13.5 pair of Wilkinson shears from Prosharp. A family company that has been in business since 1902. For tailors who enjoy German precision, a well respected company. German made Kretzer tailors shears. Note that their web site has a range from 12 inch down to smaller sizes. 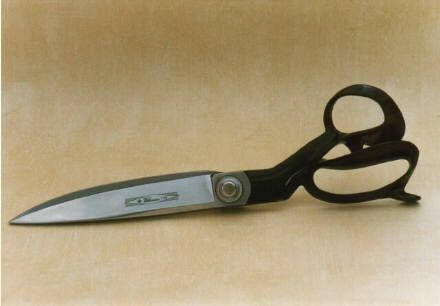 High precision Japanese made scissor and shears available from 12 inch down to smaller sizes. 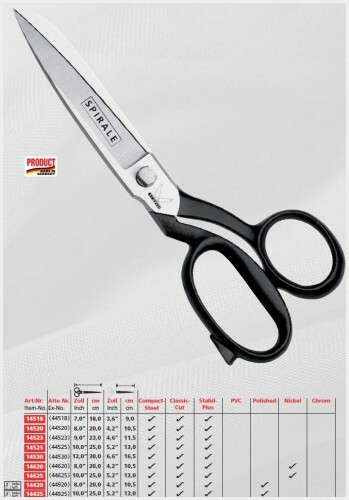 A widely distribute middle price range series of popular scissor and shears. No main link is given as they are widely distributed and available on eBay. This is a pair of the 12 inch Signature series of Mundial shears. Thats great Hutch I never found the Robuso before. How does Kretzer/spirale stand up these days? Look like they are well made, reasonably standard Solingen pattern and usually very good steel and heat treatment. Added to the list for your pleasure. I have never owned a pair of Coricama shears but I have occasionally seen a pair on eBay. They are very similar in design to the Wiss shears of about 1940 and if they are in good condition and sharp they are very good shears. From what I can tell, the batch of recent Italian made shears were made by the same company as they look identical to the Coricama shears I have seen on eBay.